Here is a brief list of some of the new books due out next month - enjoy! As always, Interweave Knits does not disappoint! Here are a few things from the latest issue that caught my eye. Lots more great patterns and articles, including Fearless Fair Isle Knitting by Mary Jane Mucklestone. A Happy Monday to you all! I just thought I would post about the projects I am currently working on. The first one is A Handsome Shawl from Victorian Lace Today . I believe I mentioned this in the last (awful) episode of the pod cast - this is my first serious lace project. I am almost done with the first part of the pattern; I think after a few more rows I will just be repeating the pattern from a certain point. I am so excited! 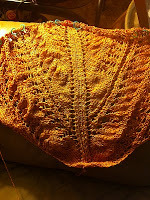 It really is coming along nicely, and I am almost encouraged to do another lace project after this is completed. I say almost, because lace requires too much attention. There is no sitting in front of the TV and knitting mindlessly. 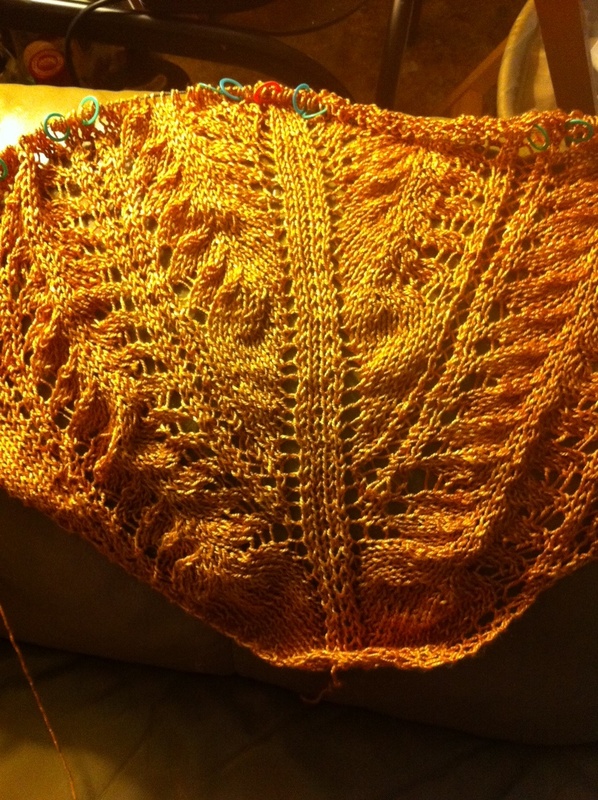 But I am sure my efforts will be greatly rewarded once the shawl has been blocked and is ready to wear. The second project I am working on is the Entrelac Throw from knit simple (as mentioned in the December 14 post). Love it so far! I played around with entrelac a few years ago just to get the feel of it, but never made anything, so this is my first Entrelac project. I love that this technique looks so complicated, but it super simple. One thing in particular that I like about this pattern, is the yarn that is used. Limerick by Wisdom Yarn is the yarn. 31801 is the color used in the magazine, however when I tried to order, they were out of stock, so I got 31805 instead. It is just as pretty, however I do want to make another throw using the 31801 too! 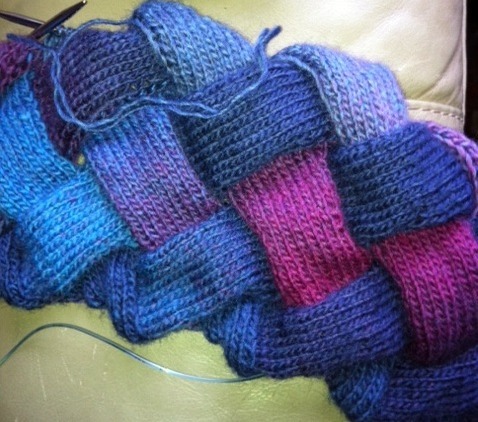 The color changes are really nice - when I was first figuring out entrelac, I was using two separate colors, and there were just way too many ends to weave it. It is much better to use a yarn that changes color itself! I found a few St. Patty's Day patterns floating around out there, but I thought this site had the best. Nice dish/wash cloths! I love dish/wash cloths, and these are very nice! Lion Brand also has a Spool Knit Shamrock Hotpad - you must register to view the pattern. It's free! And you don't get a ton of junk emails, at least I don't anyhow. That's about it - if you have any patterns you'd like to put out there, just leave a comment! In this issue you will find a great article by Lorna Miser (creator of Lorna's Laces, by the way) on floats, along with the Floating Flurry Headband. There is also a great article on increases by Margaret Radcliffe - if you are like me, you need a reminder every once in a while, and this article will do just that! As for the patterns, there is a lovely Lace Cardigan designed by Kennita Tully, a very pretty Half-Zip Cable Hoodie designed by Kristin Ford, a gorgeous Swing Jacket designed by Melissa Matthay, among many others! This is one of my very favorites, there are always so many great patterns. Get your issue today!